I took a very successful two-day chase trip to Oklahoma, with chase days on May 5 and 6. Reports on those days appear below. I left home (Edwardsville, IL) around 7:00 p.m. May 4 and drove to SGF, stopping there for the night. 10:15 - On the road from SGF. Intermittent light rain. Based on combination of CAPE, shear, upper wind strength, and upper divergence forecasts, primarily from the RUC model, my preliminary target is Lawton, OK or just west of there. 12:40 – Temporarily exit the gunge about 40 miles N of Tulsa. But still lots of cu and stratocu. 2:40 – I finally break out of the stratocu for good about 25 N of OKC. Up to this point had mostly cloudy and occasional sprinkles. 3:00 – Through OKC. Red box is issued for most of OK west of OKC. 3:30 – Stop at service area S of OKC. Check conditions with Kestrel. Wind is SSE 15-20; temp 77, dewpoint 66. Looks good! Also, in the store I finally find an OK Atlas and Gazetteer. 3:45 – Exit interstate at Chicashaw and head west on 62 thru Andarko. From there, work way S to Apache then W on 19 past Boone and routes 58 and 115. Eventually, nearing 34, I decide to backtrack E around 5 or 5:30 when I incorrectly become concerned I may be about to get W of dryline. Now working SE on 115. 6:00 – After a lot of driving around in the Wichita Mts. Area, I stop for gas and a gas station burrito in Cache. 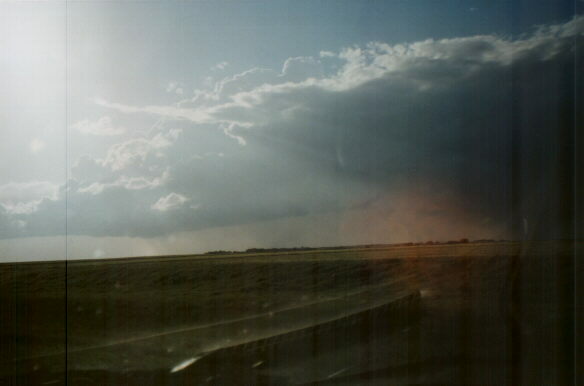 Still no sign of storms, but I decide to head west beyond the cu because wx radio reports dryline in extreme E TX panhandle w/ storms still expected to form ahead of it and rapidly go severe. Here is the SPC mesoscale discussion that led to this report. 6:15 – At bus. 62 split east of Snyder, I finally see towers going up to NW. They look low-topped but shearing to NE. I see these about 1 mi after passing Stormtracker 7 chase van. 6:17 – heading N on 183 for possible intercept near Hobart. Start to see other chasers as soon as I'm on 83. Here is what the storm looked like at this early stage - low-topped, rather high based, and not at all impressive - but the shearing off of the storm toward the NE told me the shear was conducive to supercell development if the storm could get going. 7:25 – Very nice beavertail visible – have been watching it for 20 minutes now. The beavertail looked like this when it first appeared and grew to this in about 20 minutes - very impressive! Storm has produced one small wall cloud and various scuddy lowerings, and these were showing slow but noticable rotation. Towers have been rock-hard since about 7 and are now going higher. But only a little lightning and not a lot of precip – storm looks LPish. Lots of chasers watching storm. 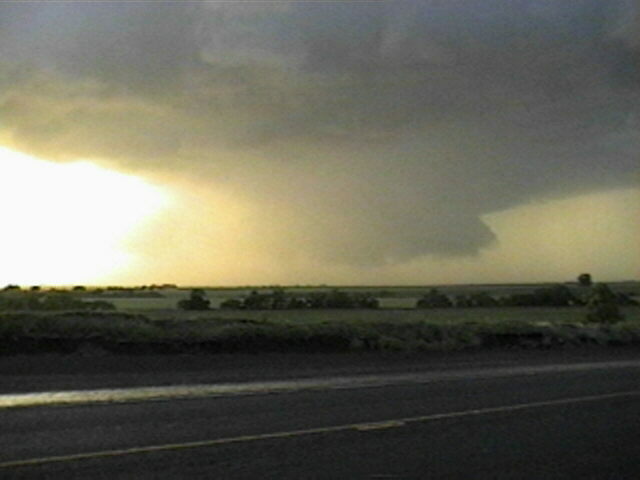 7:30 – now E or NE of Rocky. 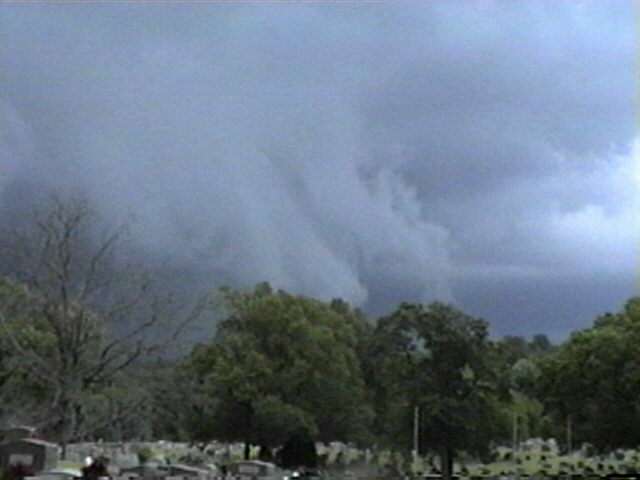 Storm forms new lowering with RFD. Though this looked impressive, it had little or no visible rotation and seemed to be associated with an occluding meso. The storm is putting down a little CG, but not a lot. Still loads of chasers. I am concerned that with storms forming up and down the line now, the system may be transitioning to a squall line. I am now in light rain from the next storm south, and am concerned that storm could weaken as it ingests rain-cooled air. 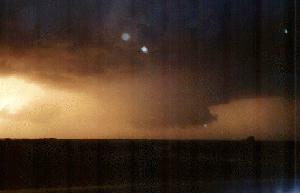 It occurred to me to break off and chase the southern storm, but I decided not to because I could not get in position before dark. I'm glad I didn't! Around 7:45 – I am in a church parking lot NE of Hobart and S of Cordell – a few miles E and maybe a little N of Rocky via section roads. I measure inflow of 25-28 mph and this is in a low protected spot – it is the strongest it has been. So far the storm seems to have a mind of its own and is not being influenced by the storm to the SW.
7:53 – SVR is issued. Storm indicated over Cordell w/ golfball hail & 65 mph wind likely. Much more lightning now. See new, partly rain-wrapped wall cloud forming. Rather than weakening as I feared, the storm is intensifying, and fast! 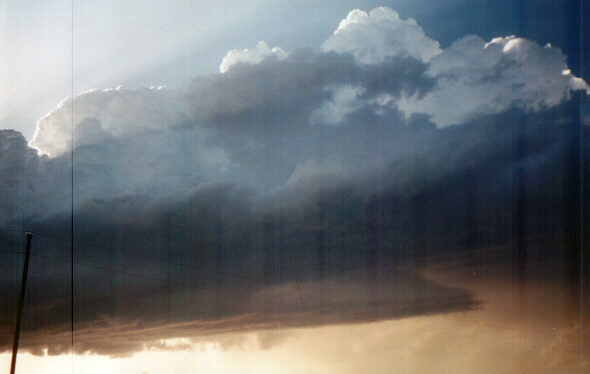 8:00 – Wall cloud more than halfway to ground. Wet RFD wraps around, partially hiding it. Spectacular as sun shines into wet RFD. I am amazed at how quickly the storm has intensified and now looks like it could tornado at any time. 8:10 – Some lowerings are visible under the wall cloud, but hard to see through the rain that is wrapping around it. It appears that a more significant lowering forms on west side of wall cloud, but it is very hard to see. I am a mile or 2 S of Cordell. 8:13 – TOR issued as tornado is reported 2 mi N of Cordell. This happens just as I have entered town. 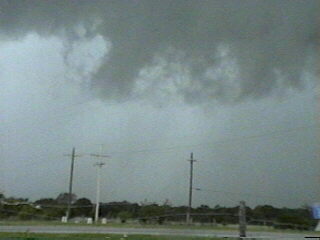 Clearly I had seen a lowering that COULD have been tornadic, but I could not confirm it from where I was. But lots of chasers and spotters were closer – they were, in fact, everywhere - so I assumed that if there was any tornado anywhere in the area, someone would be in position to see it. 8:15 – As I pass thru Cordell, chasers converge from every direction to chase N. I pull over for a moment as a police car with sirens blaring speeds toward the reported tornado. 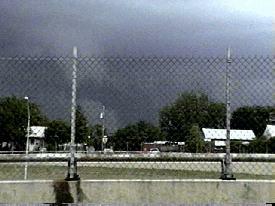 My plan had been to head east from Cordell, and had I done that, I might have gotten a better look at the tornado. But I foolishly went with the crowd of chasers blasting north. As I am near the center of town, I see a pinkish, funnel briefly - I think this was the upper part of the tornado; the lower part hidden behind trees and buildings. I stop again briefly in a parking lot in town and shoot some video, but at this time I cannot spot the tornado again. 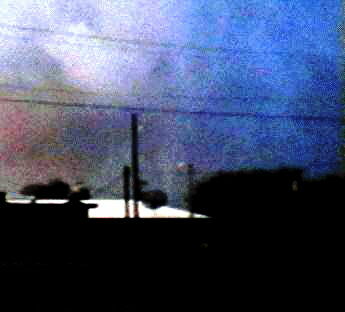 However, upon later reviewing my video, I have discovered that I did indeed get the tornado briefly on video at this time! 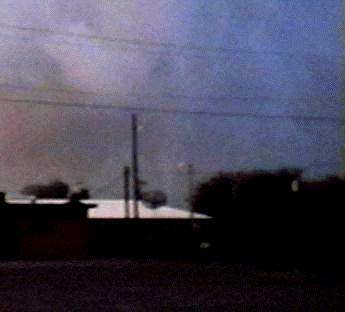 The contrast is very poor, but the tornado can definitely be seen in this video capture. It is above the sloping part of the white roof, between the two poles. 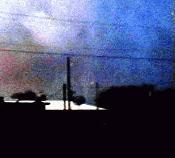 Here is an enhanced version of the video capture - it's more grainy, but the tornado is easier to see. Sometime while I was in the town - can't recall exactly when, a second or continuing touchdown is reported about 4 miles NNE of town. 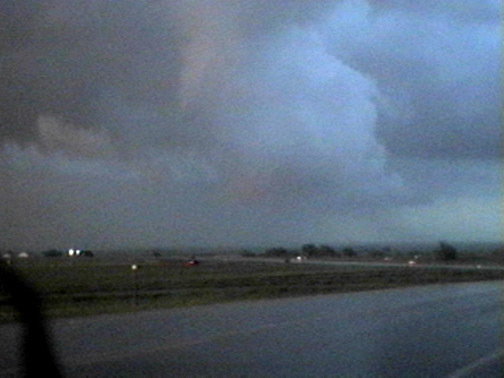 8:20 – By the time I'm thru town and have clear view, I can see the now rather wide wall cloud and a lot of scuddy lowerings nearby and under it. Concentrating on these larger lowerings, I miss seeing the small, needle-like tornado this time, but may have managed to get it briefly on video again (I am somewhat less sure about this now than I was the first time I looked at the video, though.). Spotter reports indicated that the tornado touched down briefly, then re-formed; I think this may be the redevelopment. After reviewing Scott Axelson's report and pictures , I am more inclined to think this is the case. His report (linked below) indicates two distinct tornadoes, and his pictures from the opposite direction show many of the cloud features in the positions they would be looking from the opposite way. After looking at my video repeatedly, I see what appears to be a scuddy lowering that evolves into or rotates around a funnel. 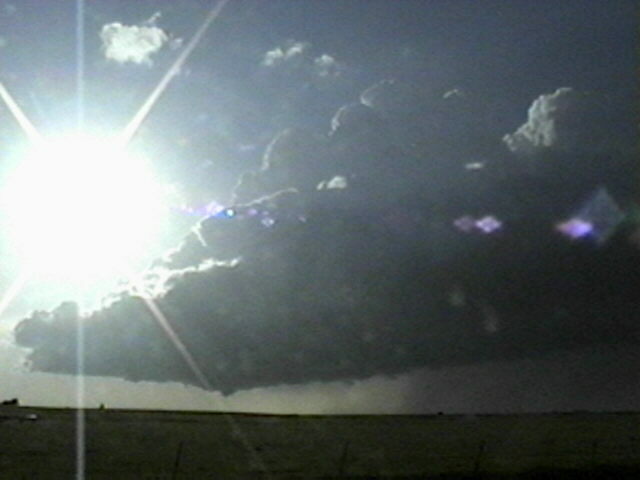 In any case, here is a video capture of this feature; note what appears to be a pinkish funnel protruding in front of darker cloud base as the sun front-lit it. 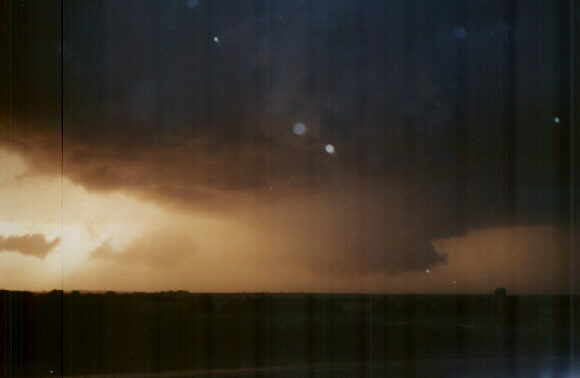 During most of the lifecycle of the tornado, the condensation did not reach the ground, though numerous spotters and chasers in better locations than mine confirmed that the circulation did. As I leave this spot to pursue the storm, I experience the only real chaser carelessness I saw as one person pulls onto road right in front of me. For the most part, though, the many chasers were considerate and did not block roads, stop unsafely, etc. 8:30 – I briefly chat with fireman as I turn east. He says he saw tornado and is debating closing the section road I have turned on to, but decides it is safe. Spotters have reported tornado 6 NE of Cordell at 8:23. As I head east, I hear that the storm just S of Cordell has intensified and now capable of producing tornado. I have noticed quite a bit more lightning to the S in the past 10 minutes or so, and as it is getting dark, I decide to work back to the main road and head north to Clinton for the night, rather than chancing getting caught by the next storm. New TOR is issued for Custer Co. as the storm is moving out of Washita Co. and toward the town of Weatherford. 9:00 – Stop for night in Clinton. 9:30 – See my storm on TWC. 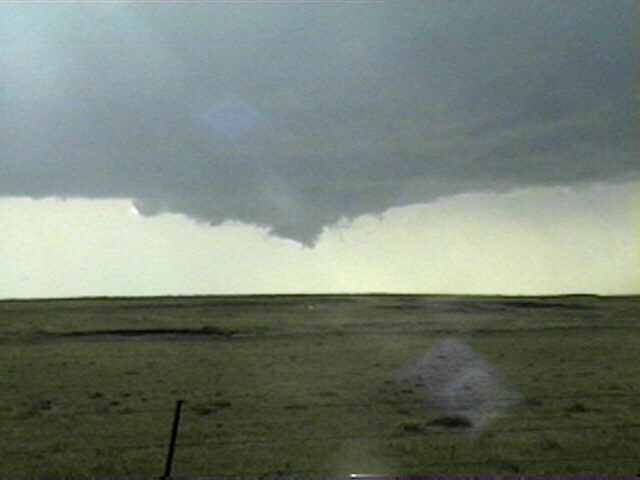 Video shows tiny needle funnel under the big wall cloud. Couldn't wait to see my video, but did: The first time I ever watch it is when I'm copying it. Local Storm Report 1 from this storm. Local Storm Report 2 from this storm. 8:31 p.m. - About 10 minutes after end of tornado. The storm is on the Washita-Custer Co. line. Note next storm south now has a hook-echo appearance and was indicated as possibly tornadic at this time, but it weakened quickly thereafter. 9:01 p.m. - This image is from around the time that a semi was blown over on I-40. Note that the storm has evolved into a bow-echo type structure. 10:00 a.m. – After a brief chat with chasers from Pennsylvania and California in the motel parking lot, I'm under way from Clinton. Head east on I-40. Preliminary target: Near or south of Tulsa, east of OKC. This is based mostly on 12Z RUC 12-hour forecast showing good CAPE in SE OK (even better in NE TX), SRH around 150, and strong and divergent upper winds in east central OK E of OKC and S of TUL. This looks better than what is suggested either by SPC outlook or TWC forecasts – though just as I'm leaving motel they greatly expand their red area. Hmmmm. 10:20 – I see overturned truck off westbound lanes of I-40 at mile marker 90. I wonder if it could have been a victim of my storm, but decide probably not because it is a little east of where I figure the storm would have crossed the freeway. However, at end of day I learn from LSRs that this truck was indeed overturned by thunderstorm winds, at 9:00 p.m. – my storm! Given that the truck was blown to the north, on its side in the ditch north of the westbound side of the freeway, it occurs to me that the storm may have produced another brief, small tornado that this truck driver was unlucky enough to encounter. Of course, the truck could have also been blown over by strong inflow winds into the storm. 12:00 – Through OKC. Though it started mostly clear, it's mostly cloudy now, cu and stratocu much like yesterday. Wind is S.
12:45 – Lunch stop in Henryetta. "Pig Out Palace Buffet" says it all. After lunch I hear statement on Tulsa NWR that chance of SVR is significant, good shear, CAPE to 3000, and shortwave approaching from SW. This confirmed what I saw on RUC, but with one change – the statement said best shear would be SE of about hwy 69 and this area was most likely to get tornadoes as shortwave moved NE from Altus/Wichita Falls region. Hence, I suckered farther E, almost to Warner, only to hear storms are initiating from Osage Co to central OK.
1:50 - Red box is issued for most of central and eastern OK from 2:30 to 8:00 p.m. I am well east of the center of it - not where you want to be when the storms are initiating along the western edge of it! This mesoscale discussion issued around 1:30 explains some of the reasons for the threat of severe wx in central OK.
2:15 - I blast back W to Okema, then on 62 NW to 48. I see a lot of darkness and some anvil spreading over the sky to the west, and other storms firing to N and far NW. I double back and forth a couple times on 48 and W to Gypsy. Finally after an hour or more of indecision, I realize that the storm to my SW is still far away. (Actually, it turns out it was all the way back near Norman.) With lousy visibility (woods and hills) and poor road network, I can't go to it, and if I wait for it I will be there a long time. Meanwhile, I see a very impressive cluster of storms up near TUL and am hearing SVR warnings for Osage Co. I decide to commit to these storms. Here is a satellite image from 4:00 p.m. The Osage Co./Tulsa storms are at the very top, near the center. Around 4:30 – after heading N on 48 to turnpike, I'm catching up to still-impressive storm N and NW of TUL. Big hard towers look to be within reach! I exit turnpike and head N on 97. 4:47 – SVR for northern Tulsa Co.
5:05 – In Sand Springs, just past where 97 meets 412, storm is just to my N. It is incredibly dark, and puts down a strange shelf cloud-wall cloud hybrid. It looked like largely an outflow feature, but it also was under a strong updraft and was lower than the surrounding shelf-cloud feature. It also showed some rotation – the lowest part surged to the ESE while cloud tags just behind moved NW. Hail shafts could be seen to its N and NW and pitch darkness under it to NE – very intense precip. Later, I learned that 3/4-inch hail covered the ground about 5 miles north of my location around this time. Also around this time, this mesoscale discussion is issued by SPC, though I did not hear it at the time. Here is a satellite image from around that time. 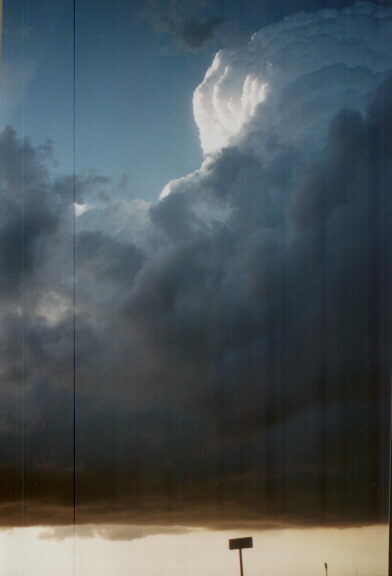 5:15 – 5:30 – I return to 412 and follow storms east. Hwy goes right by downtown Tulsa, but on Sunday there wasn't much traffic, and storms were only moving 10 mph, so I decided it would be safe to take this route. Periodically I pulled off at exits to watch storm; under the feature described above occasional scuddy lowerings appeared. Precip area behind it was incredibly dark. 5:30 – As I 'm stopped on frontage Rd E of downtown TUL, tornado sirens and warning signal on my NWR go off simultaneously. Rotation is indicated N of TUL so TOR is issued for N Tulsa Co. Movement still E at 10. I videotape a large, dark, threatening lowering that appears to go to the ground, but I am pretty sure it does not - my view of the horizon is blocked by trees, hills, and buildings. 5:36 - Severe weather statement indicates strong rotation is still occurring in the storm. 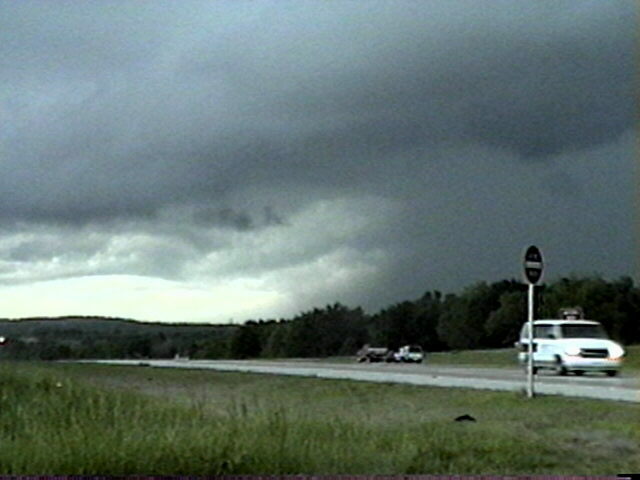 5:40 – I cautiously poke N on 169 to 36th St. As I turn N, I note strong inflow into storm from SE. Pulling to frontage road, I now see lots of chasers & locals & some spotters. 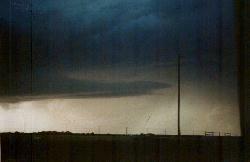 I look NW to wide (but not real low) wall cloud under SW end of shelf cloud. Occasionally it forms rounded lowerings and has scuddy lowerings, and some of the cloud tags show slight rotation. But tornado does not appear imminent. 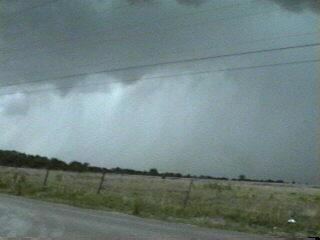 Hail does, as hail shafts remain visible behind wall cloud. As S end of wall/shelf is surging S a bit, I go E to stay ahead of it, but have to double back due to closed RD. Stop in parking lot to check storm, CG zaps down ½ mi N, but I hear instant POP! from power lines on other side of lot. Amazingly, people are out of cars watching, photographing, videotaping. Someone will get struck someday if people keep doing this. 5:44 – Golfball hail reported at hwy 75 and 66th St. – about 5 mi NW of my location. Strong rotation continues on radar. 5:50 - Now in outflow, I work E to a major Rd, and S to 412 again, as storms seem to be turning a bit right. Pass TV chase van just before 412, and loads of chasers, spotters, locals have been all over the place ever since I cut north on 169. 6:00 – I'm east of TUL on 412 with hordes of chasers and locals. Storm is going outflow dominant now, but loads of people still watching it. TOR is replaced with SVR at 6:00; threat is trending toward straight line wind rather than very large hail or tor, though some rotation still indicated on radar, and I can still see some hail shafts. A few minutes later I notice this interesting feature. 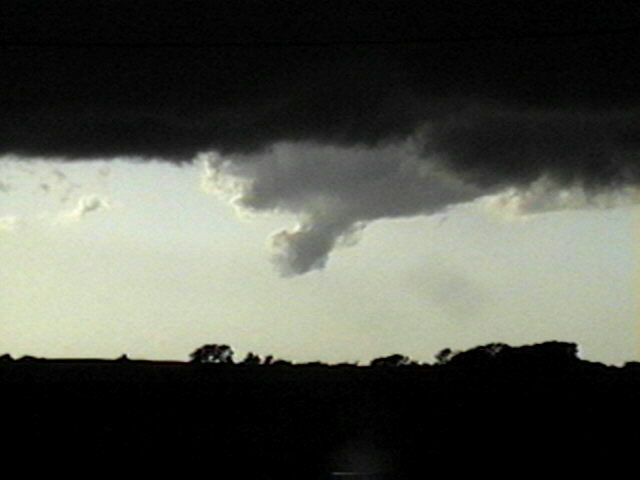 It looks kind of like a funnel, but I doubt that it was - the storm was by now going more outflow dominant. I am not even sure, looking through rain, if this is a front-lit cloud lowering or a gap between two darker, lower scud clouds - but it was an interesting feature. Here is a satellite image from around this time. 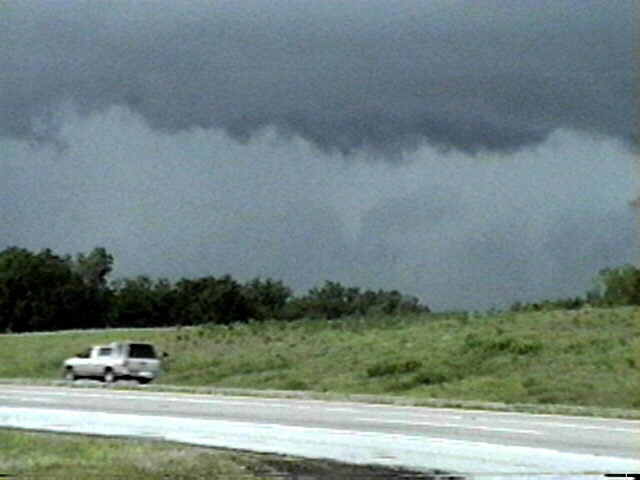 6:00 – 6:15 – I make a couple stops along 412 with other chasers. Storm becoming more outflow dominant; nice rainfoot develops at W end of main precip area. 6:30 – Storm clearly outflow dominant and weakening - but some people are still watching and videotaping it. I stop for gas and much-needed potty break. I assure concerned staff of gas station that storm is weakening and they are not in danger. Outflow is several miles ahead of main precip area now. After filling up, I decide it is safe to poke N on 69 through Choteau and up to turnpike to start toward home. Storm is now an outflow dominant squall line, but front edge is very curved at it occurs to me that northern part of it may be evolving to bow echo. From here all the way to stop for the night, I see occasional nice anvil crawlers. 9:00 – Stop for night in Joplin. 9:30 – For second straight night, my storm is on TWC! Video of 1-inch hail pounding down somewhere in N TUL. Also, TWC confirms that storm has evolved to bow echo and it does put down a bow-head tornado or 2 S of SGF. Local Storm Report 3 from this storm. 4:34 p.m. - Strong storms develop just northwest of Tulsa. Other strong storms are to the north in Osage Co. and to the west, NE and SE of OKC. 6:04 p.m. - Storms form line north and northeast of Tulsa. Note hook echo can also be seen on a storm SE of Norman that was briefly tornadic. Some thoughts – the storms these two days – though spectacular both days – were incredibly different. Saturday was basically one main storm – and LP-ish and spectacularly backlit. Waited forever for anything to initiate, but when it did, there was one game in town – except for that next storm to the S. Sunday, there were storms everywhere – interesting since it was played up to be a less extensive severe wx day than Saturday. Storms Sunday were going to town all over the place by 3:30 or so – it was much more like chasing Illinois – multicell storms all over the place and no one obvious place to go like the previous day (though some multicell storms had embedded supercells - and farther south/southwest, there were isolated supercells, where some chasers caught photogenic tornadoes). And though my Saturday storms were quicker to go outflow dominant, they were spectacular in a different way – i.e. an incredibly menacing look about them. The Tulsa storm seemed to be something of a hybrid between a squall line and an HP supercell, with a meso that produced the large hail and the tornado warning near, but not at, the tail end of the line, and on its front side. It was also interesting to watch it gradually evolve into a bow echo to my east as I headed toward Joplin. All in all, quite a productive chase trip, with two very different, but both fascinating and spectacular, days. On May 7, I returned home. I was hoping maybe some convection would fire in southern Illinois, but what action there is today is father west. I'm home around 1:45 p.m.; total chase distance 1557 miles. Commments are welcome. I would especially enjoy hearing from others who were on either of these storms - I know there were a lot of you on both of them! You can email me at jfarley@siue.edu. This page last updated May 23, 2001.